Don't worry. Be happy. 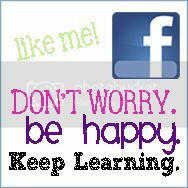 Keep learning. 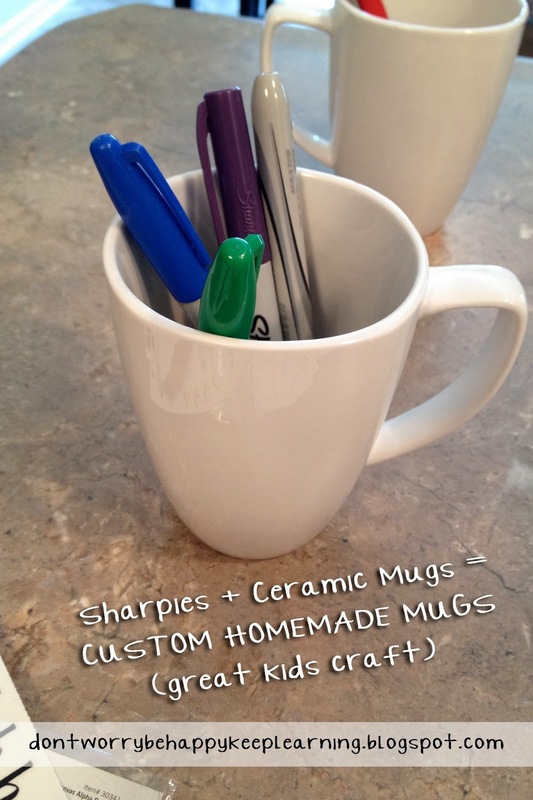 : Sharpie Mug Craft. Until my little bun in the oven is big enough to appreciate crafts I get to do fun stuff like this with my awesome niece. She generally enjoys coloring, using markers and making fun foods and sweets while at Aunt GiGi's house. I've been seeing this craft all over Pinterest for a while now and knew it was something I wanted to try. With a wedding anniversary approaching, I figured that it was the perfect time for Miss A to help me with a project she could give to her mommy and daddy (my sister and brother-in-law). Here's how we made some ordinary mugs special. 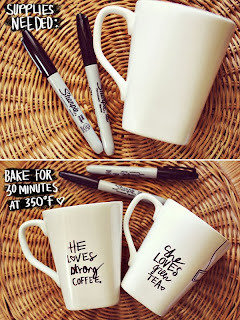 Most online tutorials suggest using oil-based Sharpies or enamel-based paints made specifically for ceramics in order for these to be dishwasher safe. Ours were made with traditional Sharpie markers, therefore they are only to be hand washed (not dishwasher safe). 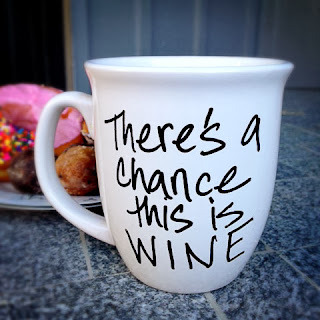 Consider yourselves warned. 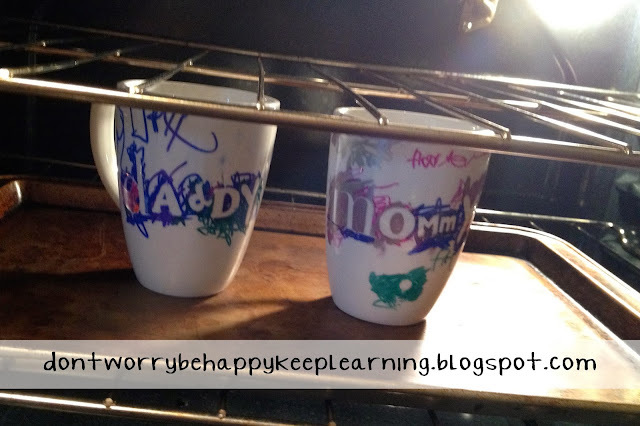 We started by applying some sticker letters to the mugs. And by "we" I mean "Miss A." She did a great job doing this with guidance. 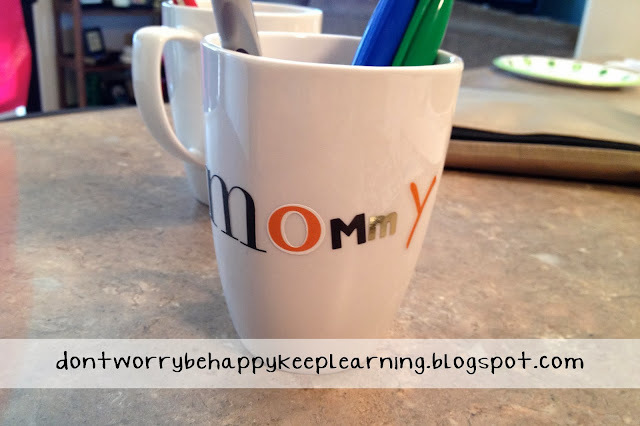 I liked the effect it gave the mugs once the letters were removed and also I have about 4,254 letters to use and figured what better way to use them! 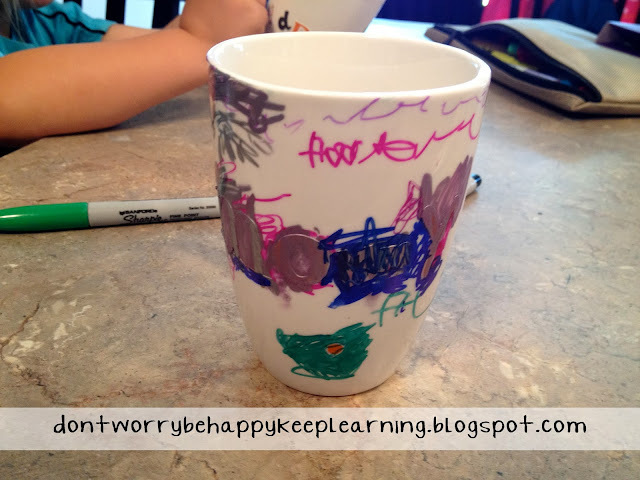 It also helped create a "cleaner" look so the mug wasn't just covered in scribbles (though, that is just as adorable when you're dealing with a 4 year old's artwork). Then I just let Miss A go crazy coloring on top of the letters and signing her name. She was fun to watch do these. She was sure to make plenty of swirls, too. 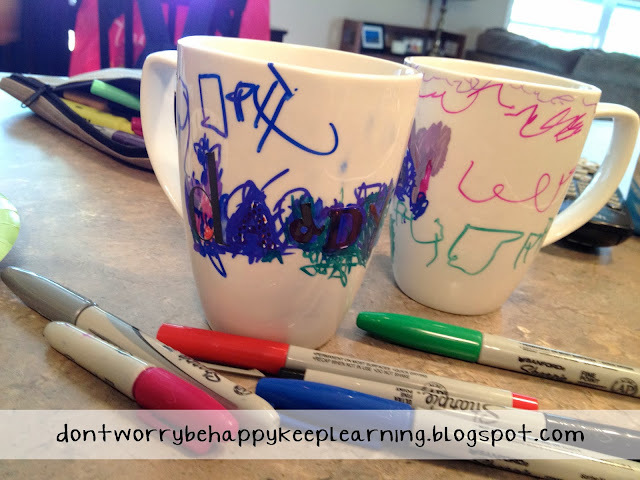 Yes, letting a 4 year old play with permanent Sharpie markers is risky and messy and a bit crazy, but you know what? I don't care. She loved it. We were busy making memories, yo. Plus, I have a wicked awesome stain remover product that took that blue Sharpie marker right out of my suede seat cushion, so no worries. No worries at all! 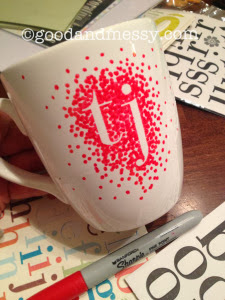 It's important, if you're going to do this using stickers, to make sure that each letter is 1) securely stuck on the mug and 2) surrounded and covered with color of some kind. This is to ensure that when the letters are removed you can see what letter is exposed. Once Miss A, the artist, was satisfied with her product she had a huge smile on her face! I didn't mess with any of the artwork, but before putting them in the oven I did add "2013" under each handle for keepsake purposes. Next, we popped those babies into the oven to set the ink! Most online tutorials suggested putting these in at 350 degrees for 30 minutes, so that's what we did. Miss A was very proud of them and had fun giving them to Mommy and Daddy! This was a fun craft to do with her. I'm hoping to find time soon to do this again on my own. I've found a few ideas online for "adult" versions of these and I think they'd be great fun to do by myself! These are some of my favorite ideas that I've found. Has anyone else done this craft? 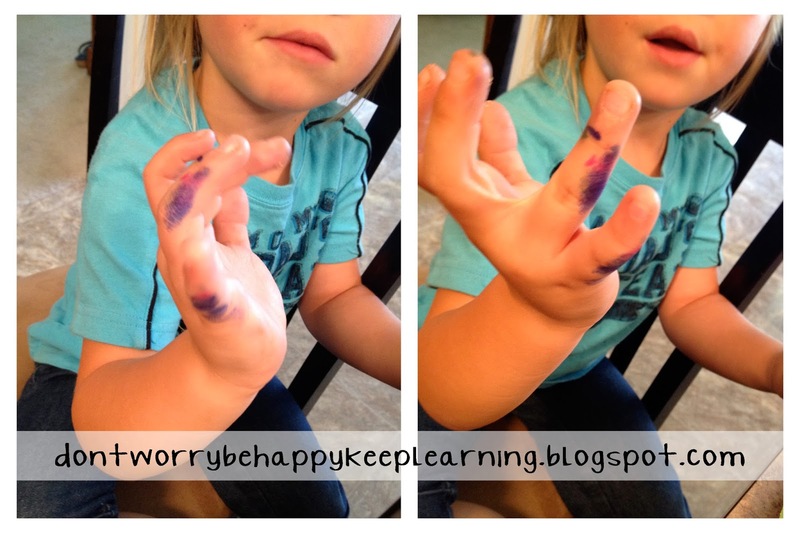 Did you use normal Sharpie markers or did you buy the special oil-based markers? I'd be interested to know how yours turned out! at 1:44 PM Topics: Blog., Crafts., DIY. PLEASE let me know how it goes! 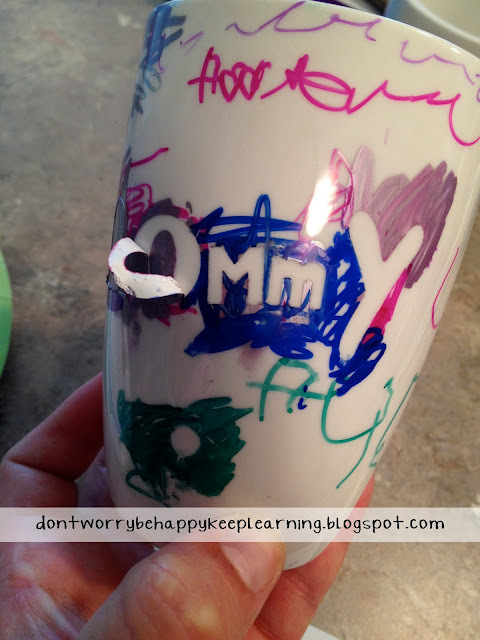 If it's worth buying the special Sharpie markers because they work, then I'll do it! 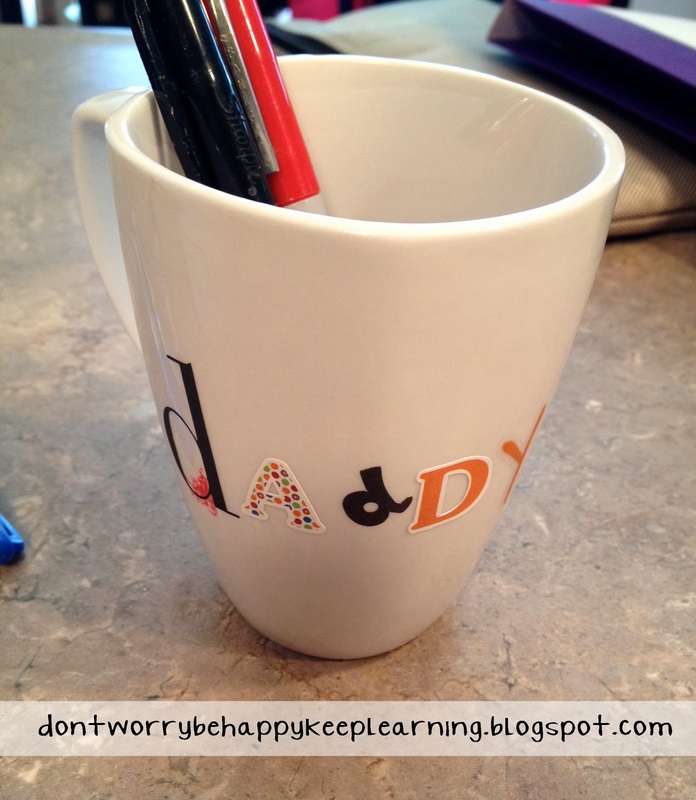 Friday 15: Ways my husband and I are different.